A critical requirement of my covered call writing system is to be properly diversified by stock, industry and cash allocation. No one stock or industry should represent more than 20% of your portfolio holdings. Owning five different stocks in five different industries would require you to own at least 500 shares since each options contract represents 100 shares. This may require a cash allotment of $25,000 to $50,000 or more. By writing calls on exchange-traded funds (ETFs) each share represents a basket of stocks and therefore is instantly diversified. There is also a benefit of a lesser time requirement. With individual equities, we are constantly changing our portfolio mix and factoring in earnings reports, technical and fundamental analysis. With ETFs, we are basically tracking as little as one security. Now if you are asking yourself why use stocks at all, the answer lies in the greater returns you will garner by writing calls on individual equities. In normal market conditions, a return of 2-4% is achievable with individual equities compared to the 1-2% for selling options on ETFs. This is because there is greater inherent implied volatility with individual equities than there is with ETFs. Investors with limited cash to invest, with low risk tolerance or with time restrictions should consider writing calls on ETFs. 3- Tax efficiency- ETFs have low capital gains because of the low turnover in their portfolios. 4- No need for a financial advisor– Why pay 1 1/2-2% a year to do something you could manage yourself? 5- Buying and selling flexibility– These securities maintain all the features of a stock, such as limit orders, short selling, stop orders and options. QQQ– follows a basket of 100 of the largest non-financial equities on the Nasdaq exchange. VTI– Vanguards security that tracks the total stock market. VV– Vanguards security that tracks the large cap universe. Did you know that there are ETFs based on Covered Call Writing? LCM, BEO, DPD, FFA, MCN, and BEP. These funds haven’t proven themselves over time plus we aren’t sure what’s going on in the other portion of the portfolio. My gut tells me that if I was going with an investment vehicle that was actively managed, I’d prefer to manage it myself, thank you. This is a benchmark index designed to track the hypothetical performance of a covered call strategy on the S&P 500 Index. We avoid earnings reports which you cannot do with ETFs. Once again, let me mention that the advantages of the BXM Index and other ETFs are the lower time and cost requirements. The approach that is best for you can only be determined by you. But by having the knowledge and evaluating it unemotionally, you will have the opportunity to make the decision that makes the most sense for your portfolio. The use of exchange-traded funds has an important role in the world of covered call writing. 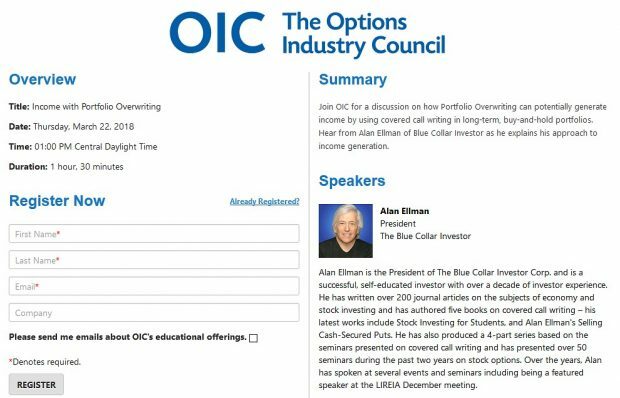 As a Blue Collar Investor and CEO of our own money we must evaluate the pros and cons of these securities and decide if they are the right underlying vehicles for our covered call portfolio. For the week, the S&P 500 rose by 0.5% for a year-to-date return of 15%, including dividends. BCI: Despite the positive economic news, the threat of increased taxes and decreased programs for the middle class on January 1, 2013, this site remains cautious and favoring in-the-money strikes, low beta stocks and ETFs. Longer term, we are bullish and looking forward to becoming more aggressive in our trade positions as soon as economic stability is confirmed by Congress. I have limited funds to invest and like the idea of staying within the S&P 500 so the Select Sector SPDRs are appealing. What kind of return should we expect from these ETFs? Thanks for all your good work. Expect 1-2% from ETFsn in general, closer to 1% for SelectSector SPDRs. The Weekly Report for 11-30-12 has been uploaded to the Premium Member website and is available for download. Buy x HTZ for $14.75. First of all, nice going William! Whenever a share price accelerates above the strike you are currently in a position where you’ve maximized your profits and have protection of that profit down to the strike price ($14 and $50 respectively). When determining if an exit strategy execution is appropriate we look to see the time value we may be sacrificing to close our positions and if entering a new trade with the cash generated from the sale of the original stocks (HTZ and ILMN) would generate more time value. HTZ: To close would cost $1.75, $1.64 of which is intrinsic value leaving $0.11 of time value. This represents less than 1% of our investment and is an excellent candidate for the “mid-contract unwind” exit strategy. ILMN: To close would cost $5.30, $3.71 of which is intrinsic value, leaving $1.59 of time value or 3.1%. This is NOT a candidate for the “mid-contract unwind” exit strategy because it is too costly. In this case you have made a nice profit so far and have protection of that profit as long as the share price does not decline below $50. I have a problem and I am puzzled as to what the best path to take might be. I bought 100 shares of GMCR on 10/17/12 for $24.05/ sh. and then sold the Nov 17 call 25 strike for 2.09 premium. On Nov. 13, I bought to close the option for .26, and then sold the Dec 22 call again for 2.37 with a 25 strike. The price on the stock soared about 10 days ago and now sits at around $38/ share. I am certain I will be called on Dec. 22, but I could roll the option up or go up and out to Jan. Cost would be about 1300. Would I be farther ahead letting the play expire or should I go ahead and roll the option? I appreciate your insight and wisdom on this. All is well with your trades because you made huge percentage returns but there is a lesson to be learned here. When you rolled the option on Nov. 13th to the Dec. 22 strike, you rolled through the Nov. 27th earnings report. It was the positive surprise that sent the share price to the moon. If the surprise was a negative one, there may have been a catastrophic loss. I’m glad there wasn’t a loss and you even have a profit to show for it. The rule is “never sell a cc option when there is an impending ER coming up before expiration Friday. Either avoid the stock or own it through the report without selling the option”. After the report passes, if the stock still meets our system requirements, then sell the option and capture the best of both worlds. That’s water under the bridge. Let’s look at today. The time value of the premium is near zero. It will cost you nothing to unwind the total position as you have maximized your return with the trade as you set it up. Once the position is closed see if you can use the cash generated from the sale of the stock to set up a second income stream in the same month with the same cash and a different equity. I have about 10,000 to invest. Would I be better off with these ETFs than single stocks? As a guideline, the cutoff between ETFs and individual equities is about $25k. From $10k to $25k I prefer ETFs for appropriate diversification and beyond $25k either security can be used. It would be great for us to share some of our trades in the blog area, do you think that this is a posiblity? I just recently started covered call trading, never heard of it before you informed me. Then I read your book and have tweeked it a little to my needs. So, I\’ll share my first two trades. First I bought RIMM 28 Nov at 11.15 per share. Then sold a call 21 Dec $12 strike for .64. That will get me 5.7% in 23 days if not called. If called, then 13.3% in 23 days. This also gives me a downside protection to 10.51. My second trade was also RIMM. Bought at 11.57 per share on 5 Dec. Sold a call 21 Dec $12 strike for .70. This will give me a 6% return in 16 days in not called. If called, then 9.7% return in 16 days. A downside protection of 10.87. Of course this doesnt include the commissions. RIMM doesnt pay dividends which was off my chart. What I did however was use some of both Buffett and O\’Neals ideas, \”new products\” coming out. With this, it helps cause that psychological drive in the price. I think by using this, you have to be careful, but you could make some money. Probably want to be out of it by the end of Jan 13, when or just before the new product comes out, when the newness factor wears out. ← S&P Futures and Fair Value.